You'd trust your life with some people. Others, you wouldn't trust for an instant, even when the stakes are low. Why? What builds the personal credibility that some people simply exude? What do they do differently? This book shows you and helps you build your own personal credibility, the #1 attribute in earning trust and achieving success. Renowned personal coach Sandra K. Allgeier begins with a set of powerful stories that demonstrate what personal credibility really consists of, how it's earned, and how easily it can be destroyed. You'll discover how small daily actions, together with specific communication techniques and decisions, shape others' view of whether you can be trusted. 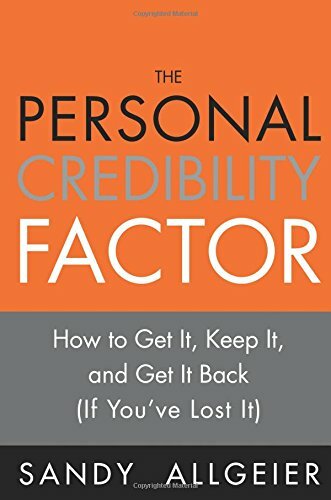 Next, Allgeier illuminates three oft-neglected, crucial secrets of personal credibility. You'll find a hands-on assessment tool designed to help you bring more personal authenticity and transparency to your interactions; as well as practical guidance on suspending judgment and really listening, thereby earning others' trust even if you ultimately choose to disagree. Allgeier concludes with seven specific steps you can take every day to increase your personal credibility, and rebuild credibility you may have already lost. Following her easy-to-understand, easy-to-use guidance, you can live a life that's not just more successful, but happier and more fulfilled, too.